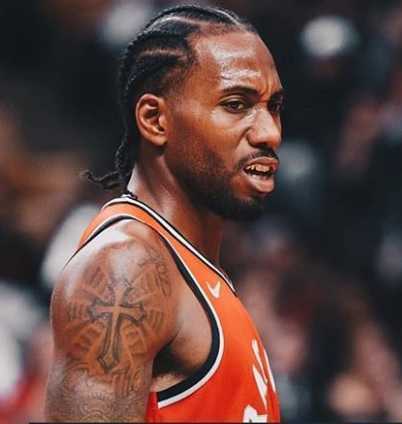 Kawhi Anthony Leonard professionally known as Kawhi Leonard is an American professional basketball player, who plays for the Toronto Raptors of the National Basketball Association. He plays in the starting forward position. He was selected with the 15th overall pick in the 2011 NBA draft by the Indiana Pacers but was traded to the San Antonio Spurs. Kawhi moved to Toronto Raptors in July 2018. He is the only third player along with Michael Jordan and Hakeem Olajuwon to win both NBA Defensive Player of the Year and NBA Finals MVP. Leonard was born on 29 June 1991. He was born to Mark Leonard and Kim Robertson in Los Angeles, California in the United States. He holds American nationality. He has 4 siblings. His zodiac sign is Cancer. He is the cousin of American football wide receiver, Stevie Johnson. He attended Canyon Springs in Moreno Valley and Martin Luther King in Riverside, California. After high school, he enrolled in San Diego State University. He played basketball for the King High Wolves. During his senior year at high school, he won California Mr. Basketball. Rivals.com considered him a four-star recruit and was listed as the No. 8 small forward and the No. 48 in the nation in 2009. He enrolled at San Diego State University in 2010. His performance in the freshman year earned him Mountain West Conference (MWC) Freshman of the year, first team All-MWC, and the 2010 MWC Tournament MVP as well. In his sophomore season at SDSU, he helped them to win back to back conference tournament championships. He was named in Consensus second team All-American 2011, NABC All-American Third Team 2011, All-Mountain West Defensive Team 2011. He also made it to the First-team All-Mountain West twice and All-Mountain West All-Tournament Team, both twice in 2010 and 2011. He forego his final two seasons at SDSU to enter the 2011 NBA Draft. Indiana Pacers selected Leonard with the 15th overall pick in the 2011 NBA draft. However, he was traded on the same night to the San Antonio Spurs. In his first season for the Spurs, he was placed fourth in Rookie of the Year voting. He was also named to the 2012 NBA All-Rookie First Team. He was chosen to play for the 2012 USA men's Basketball Select Team. He played for the Team Chuck at the BBVA Rising Stars Challenge. He was named to the 2014 NBA All-Defensive Second Team for the first time. Leonard helped the Spurs to win the NBA Championships defeating Miami Heat in 2014. He was also named NBA Finals MBP, becoming the third-youngest player to win it. He was also only the sixth player and the first since Chauncey Billups in 2004 to win Final MVP in a season in which they were not an All-Star. In April 2015, he was named the NBA Defensive Player of the Year. In January 2016, he earned his first All-Star Selection as he was named as a starter to the Western Conference team for the 2016 All-Star Game. He was named Defensive Player of the Year for a second straight year after he helped the Spurs to finish second in the Western Conference. In 2016, he was voted second in the MVP voting behind Stephen Curry. In January 2017, he was named a starter for the Western Conference All-Star team in the 2017 NBA All-Star Game. He earned his third consecutive All-Defensive First Team honors in 2017. His 2017-18 season was overshadowed by a series of injuries. In March 2018, the Spurs held a players-only meeting in which Leonard's teammates reportedly asked him to the court. However, he did not play again in 2018. In July 2018, Leonard and teammate Danny Green were traded to the Toronto Raptors in exchange for DeMar DeRozan, Jakob Poltl, and a protected 2019 first round draft pick. He made his Raptors debut in their season opener against Cleveland Cavaliers in October 2018. He was named Eastern Conference Player of the Week for games played November 26-December 2. 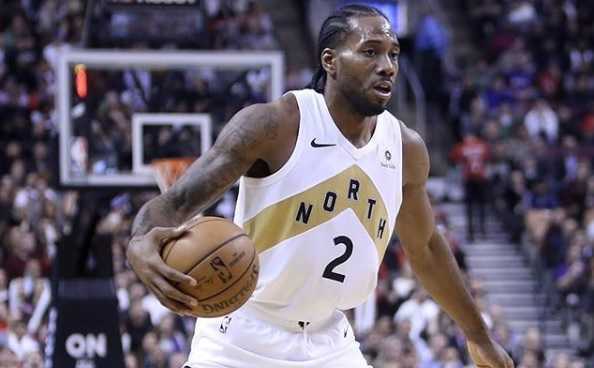 Kawhi Leonard is dating Kishele Shipley. The couple is blessed with a child, born in 2016. Besides his girlfriend, he is strictly private about his personal life. He has managed to keep his personal life away from the spotlight. He is also not available on social media. He signed a multi-year deal with the Spurs in December 2011. Kawhi Leonard stands at a height of 2.01 m i.e. 6 feet and 7 inches tall. She has a body weight of 230 lbs i.e. 104 kg. He has an athletic body build. His chest size is 47 inches, arm size is 16 inches and waist size is 33 inches. He has black eyes and his hair color is also black. He renewed his contract with the Spurs and signed a five-year contract for $90 million in 2015. He has multi-year endorsement deals with New Balance. Previously, he has also signed an endorsement deal with Air Jordan brand. As of 2018, his net worth is estimated at $25 million. His father was shot and killed in 2008 at the Compton car wash he owned. He is the cousin of American football wide receiver, Stevie Johnson. He is not available on social media. He did not play in the 2012 Rising Stars Challenge for Team Chuck due to a calf strain. He is the third youngest player behind Magic Johnson to win NBA Finals MVP. He was 22 years and 351 days at the time. He was the sixth Spurs player in franchise history to be selected as an All-Star starter. He is the second no-center player to earn back-to-back the Defensive Player of the Year. He missed first 27 games of the 2017-18 season with a right quadriceps injury.